Proto Armour for Raspberry Pi is a protective enclosure designed specifically for the very popular Raspberry Pi credit-card sized computer. Students, engineers and designers alike, all love the Raspberry Pi for its small size and big list of features and capabilities. While low cost and strong community support top the feature list, an area that challenges many Pi enthusiasts however is experienced first hand while breaking out connections to external hardware and peripherals. Attaching a few cables to the board immediately reveals how lightweight the device is and how vulnerable it is to physical harm. The Raspberry Pi, like most other development boards, is a small fully exposed circuit board with limited non-standard mounting features. Proto Armour for Raspberry Pi offers wrap-around protection and supplements the board's limited non-standard mounting capabilities with a host of structural support and standardized mounting features. Experimentation is often performed outside the safety of a lab environment. Gadgets usually contain breadboards and sensitive electronics that require a layer of protection, or better yet - a layer of armour. Proto Armour for Raspberry Pi is made from aircraft-grade aluminum using state-of-the-art CNC equipment at our facility in Orchard Park, New York USA. Parts are machined to exacting specifications, resulting in an enclosure that fits your Pi like a glove. Many surface treatments are available, ranging from a cost-effective bare metal finish, to a professional looking anodized coating in a variety of colors. Gadgets sometimes require external components or subsystems that are mounted close by. Proto Armour for Raspberry Pi features an assortment of threaded holes and structural reinforcements that facilitate the mounting of external components and subsystems directly to the case. Other versions of Proto Armour protective enclosure hardware is compatible with a variety of platforms such as Arduino development boards, Freescale Freedom Platform, and 'mbed' modules from ARM. In most cases, Proto Armour hole spacing allows for interlocking several enclosures into a single assembly. Accessories such as brackets and spacers are designed to be compatible across the product line where possible. The Raspberry Pi supports overclocking, but this practice generates additional heat that could damage the board. Proto Armour for Raspberry Pi dissipates heat from the CPU, Ethernet controller, and voltage regulator. Three heat sinks are machined directly into the top half of the housing and interface with each heat source using a thermally conductive pad. The Raspberry Pi includes five LEDs that indicate various status information. Proto Armour for Raspberry Pi features five though holes, each perfectly aligned with a Pi LED. Acrylic light pipes are included that conduct LED illumination to outside the enclosure for easier viewing. The Raspberry Pi is a very cool gadget. Whether it is a classroom setting where several Pi boards need to be attached to student benches, or at a hackerspace meetup where a new creation is on display, it is critical to properly secure sensitive and valuable hardware. Proto Armour for Raspberry Pi is assembled using machine screws that are threaded from the bottom and hidden from unintended guests. 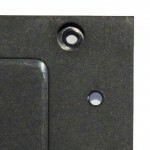 The included through holes facilitate mounting the enclosure directly to a tabletop using special tamper resistant screws. 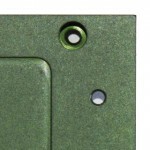 Cover plates are also available to prevent cable detachment and memory card removal. While functionality and quality are equally priority number one, affordability goes without being said. In line with the Raspberry Pi's cost effective design, Proto Armour for Raspberry Pi is designed for manufacture, resulting in a lower cost of manufacture that enables low cost of ownership. New enclosure and accessory design is a careful balance of functionality, robust construction, and affordability for all. Out of curiosity, has anyone tried to run this case over with a truck yet??!! Holy hell this is one solid case for the RPi. Worth each and every penny. While the overhang does make it a bit harder to attach and detach peripherals, I see the extra protection provided by the overhang to outweigh any inconvenience it creates. Excellant case for the Pi! These cases are machined to high specifications, are very solidly built, are great for a professional look and feel, and manage the heat well. 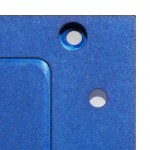 The case is cut from a block of aluminum and has mounting holes on all aides. Many mounts are threaded for easy adaption. The only downside is ends of the case cover the USB, Ethernet, and power so stubby WiFi dongles are under the overlap. Unplugging Ethernet cables can be more difficult, and plugging in power is a little more difficult. That said, These same overlaps allow for covers to be mounted that secure the usb power, cover the SD card and secure the Ethernet cable so prying fingers cannot get at them! I have used the proto armor cases for a number of projects. They are worth every penny. The cases are perfectly made to fit any pi project and the mobile apps group will work with you to create customized cases if that what your project requires. Great case, robust enough to hand to contractors for installation. Overall the product is a fantastic fit for my needs. 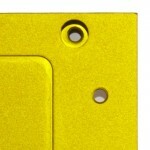 It is well made, secures the unit soundly, provides access to everything one should need on the Pi. In regards to temp, it drops the temp from using small vram stick on heatsinks by 5* F at idle and 7* F at load. 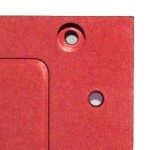 The only flaw is that the product relies on very thick thermal pads. I would like to see the effect of longer metal columns or even metal spacers with far less TIM has on temperature control. Well made product. Also, delivery was super fast. Precise construction and excellent materials at half the price of other all-aluminum Raspberry Pi enclosures. I received the enclosure today. Absolutly perfect. Obviously all as been designed with the end user needs in mind : parts are well packed, all the tools are provided, extra bits, a real treat. The Raspberry Pi ( I have the model B ) fits perfectly, absolutly no trouble. I really appreciate to feel that the people from mobileappsystems care about their clients. Keep on ! The most professional and well built enclosure for the Pi. I intend on purchasing dozens more. It's an absolutely awesome case! I am very happy with how solid and rugged it feels, it's hard to not lob the Pi across the room just to watch it (maybe) survive what would otherwise be completely devastating. However, certain aspects are somewhat awkward. I would love to have the GPIO headers extended at a 90 degree angle and accessible even within the case, so that there's no requirement to uncase the device just to add a ribbon cable. Additionally, the acryllic tubes are very difficult to line up perfectly, and have the tendency to fall out of place if the foam is not pressed down on them hard enough. It took several tries to get them to really "stick". Click the button below to add the Proto Armour for Raspberry Pi to your wish list.